Montreal rock band The Stills are coming off what could possibly be their biggest couple of years to date. 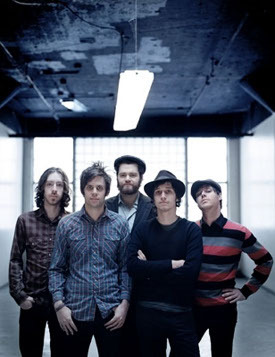 Since the release of their third record, Oceans Will Rise, in August 2008, the group has had the pleasure of playing a show with Paul McCartney, won two Juno Awards and found themselves touring with Kings Of Leon as well as Canada’s own Metric. Oceans Will Rise proved to be a great continuation of the band’s ongoing musical evolution, finding a happy medium of sorts between the synth-rock of their 2003 debut record and the indie rock of their 2006 follow-up album. As far as Stills guitarist Dave Hamelin is concerned, the sound of The Stills of the future is an unknown at the present time. It is an unknown that they are more than comfortable living with, however. While some bands purposely set out to define themselves by constantly changing their sound, The Stills prefer to let their music guide them along wherever they happen to end up. This past spring, the group were the winners of two Juno Awards – one for Best Alternative Record and the other (ironically) for Best New Group. Having won the statues undoubtedly introduced The Stills name to many Canadians who might not have been aware of them prior, while it also opened up new avenues for the band which may not have otherwise been available. “The Juno wins definitely changes how people look at you as a band in Canada,” he says. “I don’t think they (Junos) impact the rest of the world all that much but they have definitely helped change things for us in Canada. While there is little doubt about Canadian audiences having embraced The Stills, the group’s popularity is spreading well beyond our borders. In late 2008 and in March of this year, the group was fortunate enough to tour both the US as well as Australia with Kings of Leon. According to Hamelin, the international travel of the group is nothing new to the members of the band. “We have pretty much been an international act for the past seven years,” Hamelin confirms. “We have actually done the least amount of touring in Canada as compared to the rest of the world so I guess that could be one reason why we were considered a ‘new’ band as far as the Junos were concerned. With the band’s sights set on building an international following, that is the exact route that they would go on to pursue and bring them to where they are today. One minor change the group underwent when it came to the release of their third record was the changing of record label. The Stills first two records had been released on US label Vice Records while Oceans Will Rise was their first record to be released via influential indie label Arts & Crafts, a Toronto-based company which is also home to Feist and Broken Social Scene, among others. “Vice was excellent to work with; we didn’t have any problems with the label at all. There were a couple of things that had changed in their infrastructure and we decided it would be a good opportunity to try something else. Hamelin confirms that the group has a number of songs written for a new record but offers no clues to when the public might be able to get their hands on it. For the remainder of the year, he says the group is taking a break and will reconvene in the New Year to set the wheels in motion to getting a new album recorded.